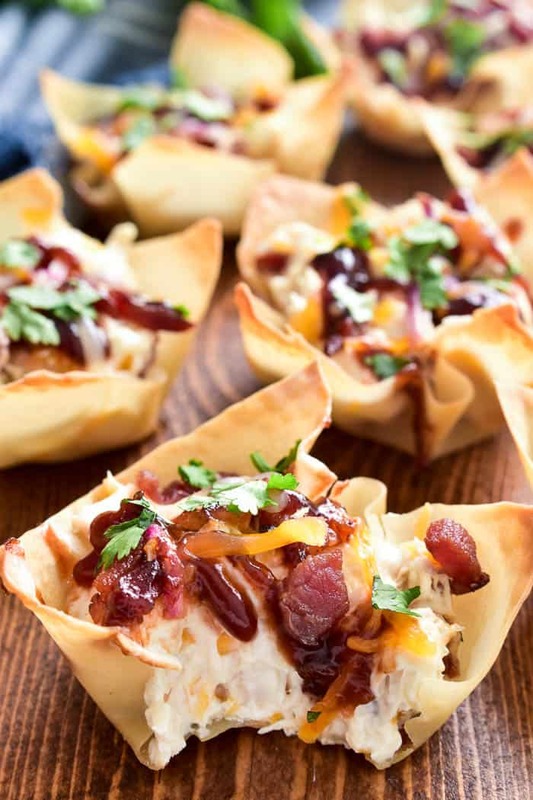 BBQ Chicken Wonton Cups are the ultimate Super Bowl appetizer! Crispy wonton shells stuffed with cream cheese, shredded chicken, and crispy bacon, then topped with shredded cheese bbq sauce, red onion, and cilantro. 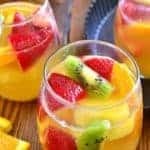 These cups are easy to make, ready in just 20 minutes, and perfect for game days, parties, or late night snacks. 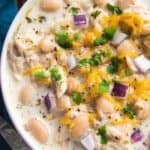 If you love bbq chicken pizza, you’ll love this crunchy, creamy bite sized twist! In Chinese cooking, a wonton is a small dumpling or roll with a savory filling. Wontons are made by spreading a square wrapper flat, placing a small amount of filling in the center, and sealing the wonton into the desired shape by compressing the wrapper’s edges together. 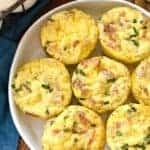 These wonton cup appetizers use wonton wrappers in a slightly different way, by pre-baking them in a muffin tin, filling them with a savory filling, and baking them until they’re crispy. WHERE CAN YOU BUY WONTON WRAPPERS? Wonton wrappers are available in the produce section of most grocery stores. They can often be found near other Asian ingredients. HOW DO YOU MAKE BBQ CHICKEN WONTON CUPS? Spray a 12 cup muffin pan with nonstick cooking spray. Place one wonton wrapper in each cup and press down in the center. Pre-bake wonton wrappers for 8-10 minutes, until light golden brown. In a small mixing bowl, combine 4 oz. 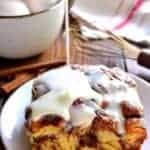 cream cheese, 4 oz. sour cream, 1c. cooked, diced chicken, 1/2 c. shredded cheese, and 2 Tbsp. crumbled bacon. Mix by hand. Spoon filling into pre-baked wonton shells. Top with additional 2 Tbsp. shredded cheese, 2 Tbsp. crumbled bacon, and sliced red onion. Bake for an additional 8-10 minutes. If necessary, cover with foil for the last few minutes to prevent over browning. CAN WONTON CUPS BE MADE AHEAD OF TIME? Yes, partially. You can pre-bake the wonton shells and store them, covered, at room temperature until you’re ready to use them. 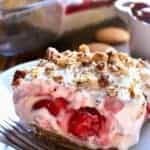 You can also mix the filling in advance and store it in the refrigerator. However, I would not recommend assembling and baking the cups until you are ready to serve them. You guys. We’ve almost made it through January. How’s it going? Are you still going strong on your resolutions? Well…even if you are, I’m about to change all that. Because the Super Bowl is rapidly approaching, and the cold winter weather has finally settled in. Which can only mean one thing: time for comfort food. Specifically, time for appetizers! And I’m not just talking any old appetizer recipes. Because when it comes to the Super Bowl, only the best will do. Only the cheesiest, gooiest, most delicious appetizers are fit for the big game. And luckily? These BBQ Chicken Wonton Cups are all of that. I’m always a fan of wonton cups. In fact, they’re some of my favorite appetizers ever. 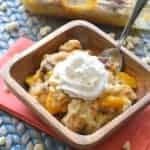 Jalapeño Popper Wonton Cups? Crab Rangoon Wonton Cups? Buffalo Chicken Wonton Cups? Yes, yes, and yes. 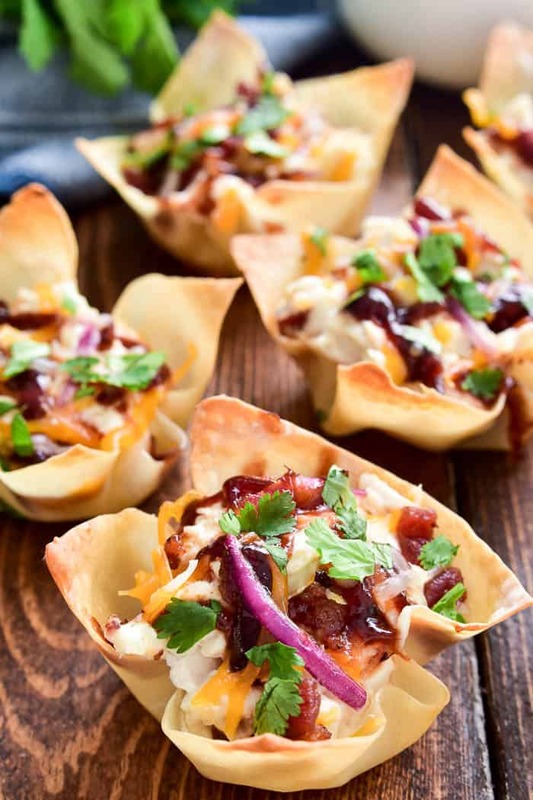 And I can’t wait to try these Sausage Wonton Cups….yum! And these bbq chicken wonton cups do NOT disappoint. They’re loaded with all the flavors of bbq chicken pizza – from the chicken to the cheese to the bbq sauce, red onion, and cilantro – and they’re literally so easy to make. Simply prebake the wonton shells, mix the filling, stuff, bake, and garnish. And voila. You have a bite sized snack thats game day ready. 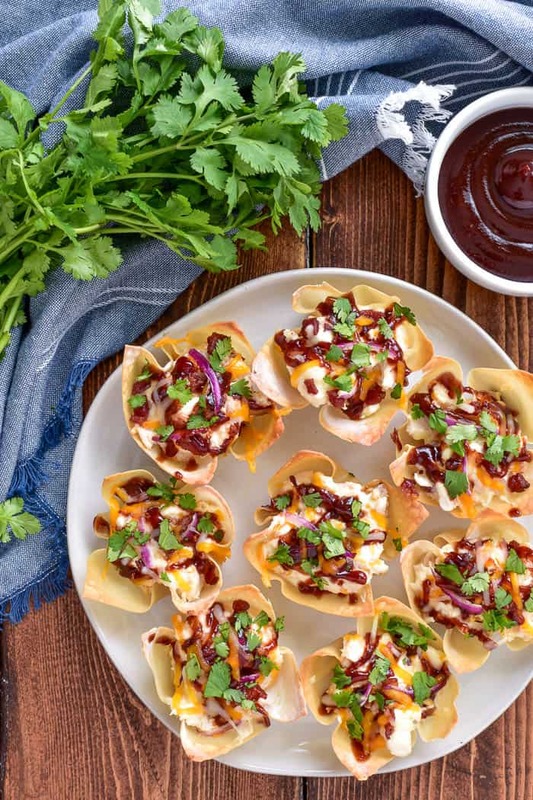 These bbq chicken wonton cups are perfect for grabbing, easy to eat, and guaranteed to be a HUGE hit. Because who doesn’t love chicken…and cheese…and bbq sauce?! 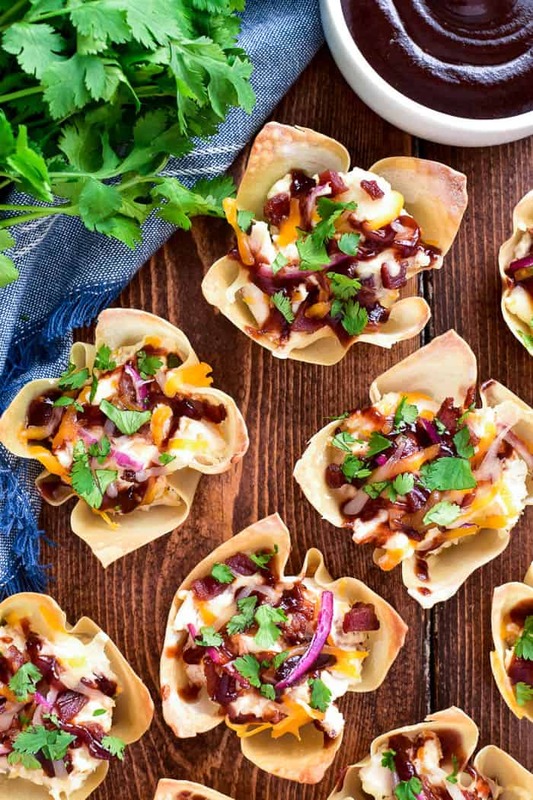 Whether you’re hosting a super bowl party, heading to a friends house, or just looking for an easy appetizer recipe to have on hand, these wonton cups are a must make. Just beware….one you start eating them, may not be able to stop! 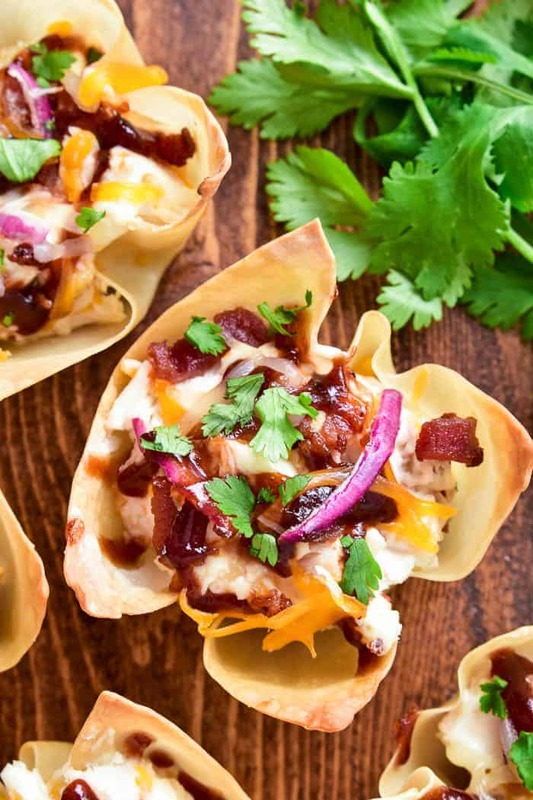 BBQ Chicken Wonton Cups are the ultimate Super Bowl appetizer! Crispy wonton shells stuffed with cream cheese, shredded chicken, and crispy bacon, then topped with shredded cheese bbq sauce, red onion, and cilantro. These cups are easy to make, ready in just 20 minutes, and perfect for game days, parties, or late night snacks. 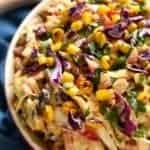 If you love bbq chicken pizza, you’ll love this crunchy, creamy bite sized twist! I can’t resisit these when I see them at a party! The BBQ with the bacon and that bit of red onion….it’s just so good! 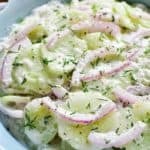 What a great appetizer for any get together! Such great flavors all in one little cup. Oh my gosh these look like so much fun!! 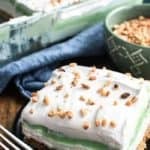 These look absolutely scrumptious and perfect for entertaining! Does it have BBQ sauce in it??? I decided not to add bbq sauce to the filling, since it would have turned it pink. Instead I drizzled it generously on top. 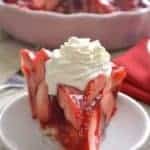 If you’d like to add some to the filling, feel free!